Welcome to the Playbarn - a fun packed indoor and outdoor centre especially designed for children aged 7 or under. The Playbarn is a fun packed farmyard based adventure centre especially designed for children under 7 years. Set in the countryside only 10 minutes from Norwich off the B1332 Bungay Road and is open throughout the year. Past winners of the National Farm Attraction of the Year, the Playbarn offers a variety of indoor and outdoor play areas. Indoor activities include a Beach Barn, giant climbing frame, soft play area, ball pool and quiet areas to read and relax. 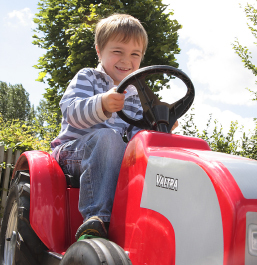 Outdoor activities include an outdoor climbing den, tractor courtyard with ride on tractors, electric tractors, barking diggers and electric sand digger. From Easter to October Pony rides and Tractor rides are available on certain days. The children's farm is open Easter to October half term. We have lots of indoor and outdoor areas for you to eat -Snacks and light lunches are available from our coffee bar. We have a large car park and easy access for the disabled. Why not become a member - three months for £40- this allows unlimited entrance for one adult and one child, very good value for money and perfect for those who live locally and pop in all the time!